The media blitz surrounding the delivery of Tesla’s first Model 3 sedan, the company’s first mass-market vehicle, got many in the energy market thinking about the impact of greater electric vehicle (EV) adoption. Does this represent a major risk to oil demand, a potential boon for natural gas-fired generation, both or neither? Today we’ll put some numbers to the potential impact that EVs could have on the US electricity market and attempt to quantify the opportunity for additional natural gas demand. Note that this blog is meant to be more of a ‘back of the napkin’ type of exercise rather than a sophisticated endeavor. First, let’s figure out how many EVs we might expect on the road ten years from now. 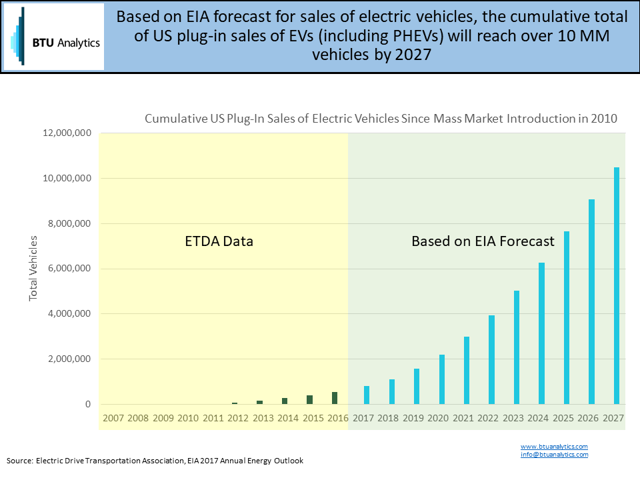 The chart below presents one case based on the EIA’s projection for sales of battery electric and plug-in electric hybrid light-duty vehicle sales found in the 2017 Annual Energy Outlook. Note that historical data is sourced from the Electric Drive Transportation Association, a trade association promoting electric drive technologies. We’ll assume for simplicity sake that all plug-in electric vehicles sold since 2010 remain on the road through 2027, giving us approximately 10.5 million EVs and plug-in hybrid electric vehicles (PHEVs) by that date. As a point of reference, 17.4 million new vehicles were sold in the US in 2016 alone, of which 157k were EVs and PHEVs. While the true impact of electric vehicles on electricity demand and the power system is a complicated subject (and many promoting the use and adoption of EVs believe they will be powered by renewables or residential solar), let’s assume for a moment that the load from electric vehicles is completely incremental and that all this new demand for electricity will be met with gas-fired generation. Based on the assumptions outlined above, electric vehicles in the US would add incremental annual demand of 12 TWh by 2027, up from approximately 1.1 TWh today using the same assumptions. Converting that to a gas equivalent using a 7.5 heat rate gives us an estimate of 0.76 Bcf/d of potential demand from US electric vehicles by 2027. 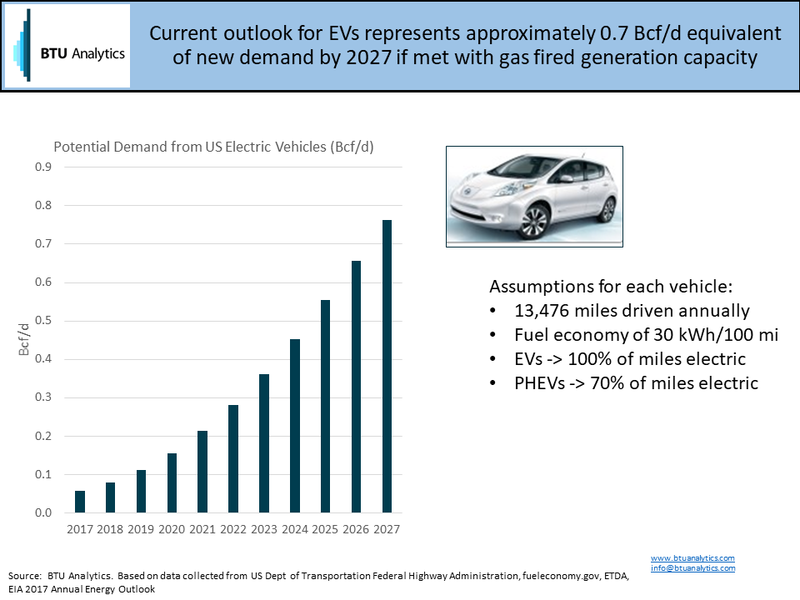 While the widespread adoption of electric vehicles appears to be the future many market analysts believe we are moving towards, it doesn’t currently seem that it will lead to a jump in natural gas fired demand in the near future. However, the timing of truly disruptive technologies often surprises the most entrenched market experts. Shale boom, anyone?